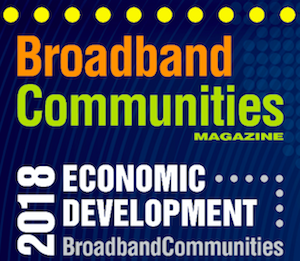 In September, we told you about the upcoming 2018 Broadband Communities Economic Development Conference set for October 23rd - 25th in Ontario, California. “Fiber For The New Economy” will bring a long list of creative, intelligent, and driven thought leaders together to discuss the infrastructure we all need. Those of us from the Community Broadband Networks Initiative also know of one attending speaker who describes himself as “giddy” — Christopher. James Fallows, a National Correspondent for the Atlantic Monthly, has reported from all over the world. He’s written 12 books, including his latest that he wrote with his wife Deborah, titled, Our Towns: A 100,000-Mile Journey into the Heart of America. He’s won several awards for his writing, including the National Book Award, National Magazine Award, and a documentary Emmy. He’s provided commentary pieces for NPR and spent time as a chief speech writer for President Jimmy Carter. Deborah Fallows has also written for the Atlantic. Her CV includes National Geographic, Slate, The New York Times, and the Washington Mostly and three books. Deborah is a linguist as well as a writer, reflected in her works. Check out the full list of speakers and panelists here. Look for Christopher, who will be participating in the Blue Ribbon Panel Session along with Dr. Nicol Turner-Lee from the Brookings Institution and Will Rhinehart from the American Action Forum. Lev Gonick, CIO from Arizona State University, will lead the conversation. We expect to see a spirited debate at this panel discussion. Christopher will also lead a panel on the increasing role of rural cooperatives and how they're bringing broadband to members and nonmembers. On the afternoon of October 23rd, Christopher will be participating in the special event hosted by the Coalition for Local Internet Choice (CLIC). He’ll participate on the panel titled “The 2019 State Legislative Session and the BDAC: Challenges and Opportunities for Local Internet Choice.” Attorney Jim Baller will moderate the panel that will analyze the FCC’s Broadband Deployment Advisory Committee (BDAC) model codes, potential state legislation, and discuss ways to prepare for the upcoming legislative session. In addition to Christopher, Lisa Youngers from the Fiber Broadband Association and Drew Davis from Larimer County, Colorado, will participate in the panel discussion. Learn more about the special CLIC session and how to register here. View the full agenda for the event. You can still register online for the Ontario BBC conference.